Mike Petrik is an animator by day and an illustrator of books, magazines, and wonderfully scary doodles by night. He’s contributed to such publications as Highlights for Children and is also the illustrator of Johnny Works with One Hammer by Nicholas Ian. 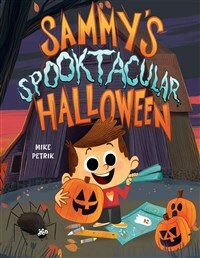 Mike has always loved Halloween and has created many spooktacular haunted houses over the years. He lives with his family near Chicago, where he waits each year for the best day ever . . . Halloween! Learn more at www.mikepetrik.com.